While the financial services and shipping industries have been quick to deploy blockchain, the healthcare industry could soon follow their lead as it looks to increase efficiency and security, reduce costs and expand services with the distributed ledger technology. In essence, blockchain could help reshape healthcare interoperability by serving as a next-generation middleware that couples health data with decentralized, distributed, and immutable qualities, according to a new report by IDC Health Insights. As a result, by 2020, 20% of healthcare organizations will have moved beyond pilot projects and be "using blockchain for operations management and patient identity," the report said. While blockchain may be moving from test cases to production systems in other industries, its adoption by healthcare has been slowed by the technology's nascence coupled with heavier regulatory and security concerns, data harmonization, and blockchain resource availability, the report said. Last year, the agency's IT department published a research paper on blockchain's attributes and vulnerabilities. It noted that cryptography used to secure the blockchain itself and communicate between the elements of the system provides integrity on messages from users or between server nodes. "It ensures participants can see the parts of the ledger that are relevant to them, and that transactions are secure, authenticated, and verifiable," the VA paper stated, noting that with "permissioned" blockchains, users have to be enrolled before they are allowed to add or review records. To date, however, the VA has yet to test blockchain related to its massive healthcare system. Communicate transparently regarding the pros and cons of blockchain interoperability by ensuring that any decisions taken are evidence based and informed. Demonstrate a blockchain interoperability proof of concept by revealing how decentralized, distributed, and immutable properties could contribute to stakeholder and organizational goals. Advocate for blockchain interoperability with providers and patients who would be encouraged to no longer have to endure any frustrating burdens to get the data they need when and where they need it. Adopt blockchain interoperability early, if you do plan to adopt it, as this allows for first-runner gains to manifest prior to the competition, and tackle the concerns by going private if public seems too risky. While there is some degree of network interoperability between healthcare providers, pharmacies and insurance companies through various frameworks like HIEs, they've had "varying degrees of success and penetration," IDC said. It cited innate shortcomings that include "limitations in the interoperability standard or protocol itself, workflow and policy differences between entities, information blocking, and technology requirements." Two leading HIEs – CommonWell Health Alliance, a trade association working toward healthcare record interoperability, and Carequality, a public-private collaborative created to establish a common interoperability framework – have had success in establishing a solid industry foundation for data exchange with the backing of EHR vendors. "And that's facilitating a somewhat limited form of query-based [data] exchange," said Mutaz Shegewi, IDC's research director for provider IT transformation strategies. Shegewi was referring to the ability to search for secured patient information online. "So, I don't think they're falling short, but there are limitations in terms of how many of them can do health information exchange orientated around the long term," Shegewi said. The problem is multifaceted, but primarily stems from a lack of unified data standards, frameworks and protocols that span healthcare facilities and the industry as a whole, according to Shegewi. "It's the variety of EHR systems and interfaces, data sources, and uniformity in workflows," he said. "It's a big conundrum." Because it's a transparent, electronic ledger that can be shared among a permissioned group of users, allowing everyone in the group to see the latest data in near real time, blockchain could improve patient data discovery across a wide specrtum. It can also leverage the open, API-compatible Fast Healthcare Interoperability Resources (FHIR) interface, a set of standards that will be available in every major EHR to consolidate lifetime clinical records from different EHR providers. Acting as a mesh network, blockchain could accelerate clinical data distribution while using FHIR to standardize the data format, patient profiles, and secure indexes at the coding level, according to IDC. "It doesn't really influence the way data is conveyed or any data rules or anything that would take data to the next level. It's the lattice work or the skeleton for it," Shegewi said. Blockchain could, for example, play a supportive role in a variety of areas: allowing for shared statistics on population health, clinical trials research, drug supply chain integrity, remote auditing, claim adjudication, and professional credentialing, IDC said. Not only can it record any event, such as a patient diagnosis or treatment, drug prescription or insurance payout in chronological order, it can store those events as unchangeable records. With blockchain, additional data points can be added but previous entries are unalterable. So, in essence, it offers a single "source of truth" for everyone authorized to view data in the online network, according to Shegewi. "Blockchain paves the way for interoperability to happen at some point. It's better distributed. It's more decentralized. It's more permanent, more transparent, more accessible," Shegewi said. But that won't happen overnight, especially in a highly regulated industry that's necessarily cautious about how it handles sensitive patient data. "In terms of blockchain being widely adopted as a core technology in healthcare, that's going to be a much longer time line – maybe well beyond five to seven years in terms of being central to clinical workflows," Shegewi said. "I think everyone's enthusiastic about blockchain. Adoption is not a technical issue. It's getting the foundations in place because this is a highly regulated industry," said John Sculley, chief marketing officer of Massachusetts-based start-up RxAdvance, a pharmacy benefit management (PBM) cloud service. The PBM and specialy drug industry is an $840 billion marketplace, Sculley said, yet it's largely using the same technology on which it was built 35 years ago. "It’s still mainframes, like AS400s; it’s still green screen command line Cobol-programming," he said. While RxAdvance is aimed at streamlining the adjudication process for reimbursements between pharma companies, healthcare plans and insurers, it is not currently based on blockchain; Sculley, however, believes the distributed ledger technology will be foundational within five years. "We're not deploying it now because there are so many regulatory issues," said Sculley, the former CEO of both Apple and Pepsi-Cola. "So, that's not the low-hanging fruit for us. But we do understand it will eventually be mainstream." Blockchain's ability to create an unbroken chain of data entries from point of origin to transaction completion, and secure that data through cryptography, offers a "huge advantage for privacy," Sculley added. And "it's obviously more efficient. "Building more and more systems in healthcare that will be cloud based is another reason why blockchain will make sense," Sculley said, referring to the online, peer-to-peer architecture on which blockchain exists. Big tech players, such as Amazon, Apple, Google, IBM, and Microsoft -- even retail giants like Walmart -- are aggresively staking a claim in healthcare and in many cases how blockchain might be applied. Beyond solving interoperability issues, blockchain could unleash value from today's stagnant, siloed healthcare data repositories by serving as smart contracts – scripts that self-execute based on pre-determined rules. For example, if a patient were to fill out paperwork in one doctor's office and then, a few months later, go to a different physician, a smart contract could automate the transfer of patient data based on pre-set rules the patient could control. "One big pain point for providers and payers is preauthorization and availability checks – running processes to ensure a patient is eligible for a care option or treatment or intervention," Shegewi said. Following pre-determined rules of approval, smart contracts could check a patient's record to automate that process. A blockchain-based smart contract could also automate payment for a treatment once a healthcare provider, patient and insurer all agree treatment has been done. Having a transparent platform using a standard data model would also address the patient information blocking that sometimes occurs between EHR systems. 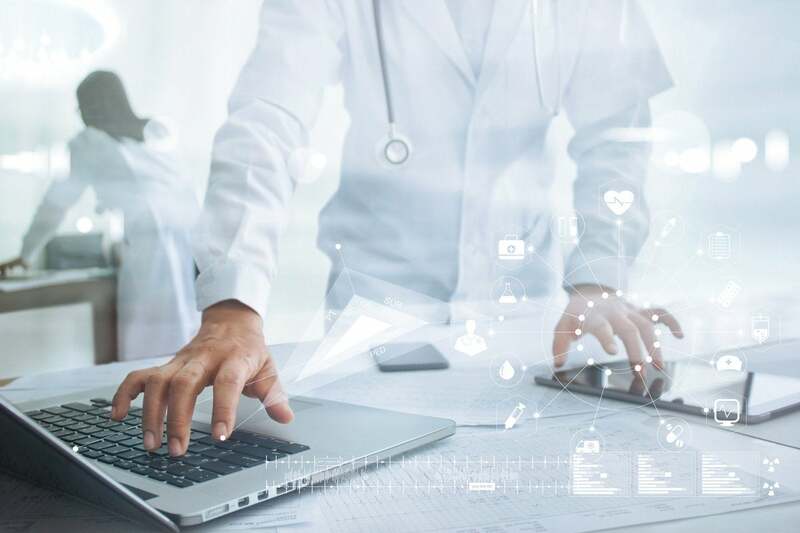 Since the enactment of the HITECH Act of 2009, which required the industry to adopt EHRs, data sharing between disparate vendor platforms, geographically dispersed facilities and unassociated medical institutions has improved; but data transparency has not. EHR vendors still use proprietary protocols to corner their respective markets, meaning not all data is shared equally. In fact, some vendors have been accused of working to ensure data can't be shared easily. "The industry is in a better place in terms of openness and wanting to exchange information and data," Shegewi said. "Still, there is some information blocking if they can get away with it." Additionally, blockchain would give patients more control over their own health information, something proprietary systems stifle. Under current federal guidelines for Medicare and Medicaid reimbursement, U.S. healthcare providers are rewarded for meeting performance goals, "while the most important influencers of care (i.e., patients and their families) are largely left out of the data equation," IDC said. Patients could see another advantage: Because blockchain can create cryptocurrencies, patients could get digital tokens as an incentive to share data. Among those looking seriously as blockchain now is the Mayo Clinic and London-based start-up Medicalchain; both are working together to develop a variety of services in the future. Medicalchain created a blockchain-based EHR ledger that can be used by patients, healthcare providers and insurance companies to exchange EHR information; the first application for its platform was a telemedicine service called MyClinic.com, which allows patients to consult healthcare providers remotely. The platform also allows them to share their anonymized medical data with researchers, and in return to get Medicalchain's cryptocurrency: MedTokens. 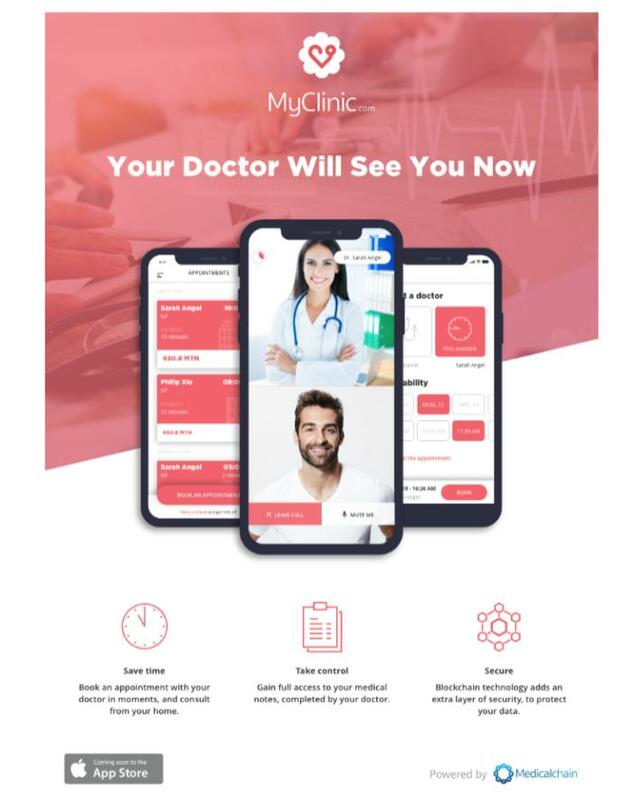 MyClinic.com allows patients to consult healthcare providers remotely, share anonymized medical data with researchers and get MedTokens for doing so. Mayo Clinic, which has three main campuses and more than 70 smaller hospitals, is not currently looking for ways to use blockchain to secure EHRs; It's working with Epic Systems, one of the top five EHR providers, to roll out a single, integrated health record and billing system -- a monumental task in and of itself. "We will explore various potential benefits of blockchain technology in healthcare – to bring efficiencies and strengthen security in data transactions. The agreement [with Medicalchain] has just recently been signed, so the explorations are in very early stages," a Mayo spokesperson said via email.